So they say the Whedons are making us a sequel, to Billy’s tale of laughter, love and loss. So they say it’s a movie, so fantastic! Chances are you need no introduction to Doctor Horrible’s Sing-Along Blog – the three-part webisode musical brought to us by the Whedons and all their associated geniuses. Even if you didn’t regularly traverse the planes of the interweb, it won a bucketload of awards and commendations, including in 2009 an Emmy for Most Incomprehensible Category (sorry, I mean, ‘Outstanding Special Class – Short-format Live-Action Entertainment Programs’). And thus despite being originally web-based media, Doctor Horrible announced itself to those who may have never otherwise even heard of or experienced it’s brilliance. Bring on more frozen yoghurt! It spawned a comic prelude, a fan-made prequel, and a phenomenal 8-bit video project. There have been whispers if everything – “from actual studio film to bumper sticker”. The latest news we can find on the sequel came via an MTV interview with Nathan Fillion, confirming that it will be musical – that it has a title (but he’s not telling) – and so one can assume, that he’ll be reprising his role as Captain Hammer. But what would the sequel story cover? Will it be set before or after the original? Will Moist get to do a song (not only on the Commentary! this time)? Will Captain Hammer get to use the Hammer Cycle? Will the groupies be back? Where will Felicia Day fit into it (“We love Felicia so much. Maybe she’ll do catering while we shoot the movie.” – Maurissa Tancharoen, c/- Scifiwire)? Will Billy make it out of his blog? It’s a brand new day, and our hopes are high, but we don’t need to fear, the sequel must be nigh..! 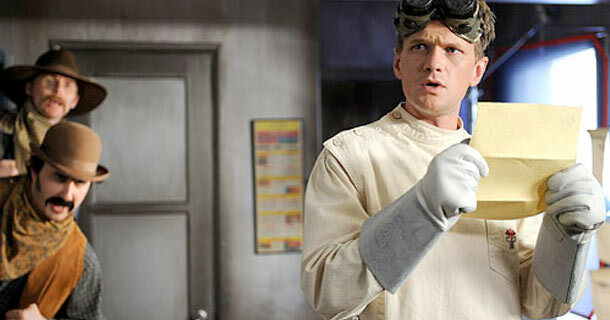 Dr. Horrible’s Sing-Along Blog is available on DVD and Blu-ray from Amazon. Thanks for sharing, I found this story while surfing for song lyrics, useful comments and good points made.